Stuart, Fl- April 5, 2019 - One of the most effective ways to prevent underage drinking is to encourage youth to research the dangerous effects of alcohol use on the teen brain, and to involve them in educating their peers. 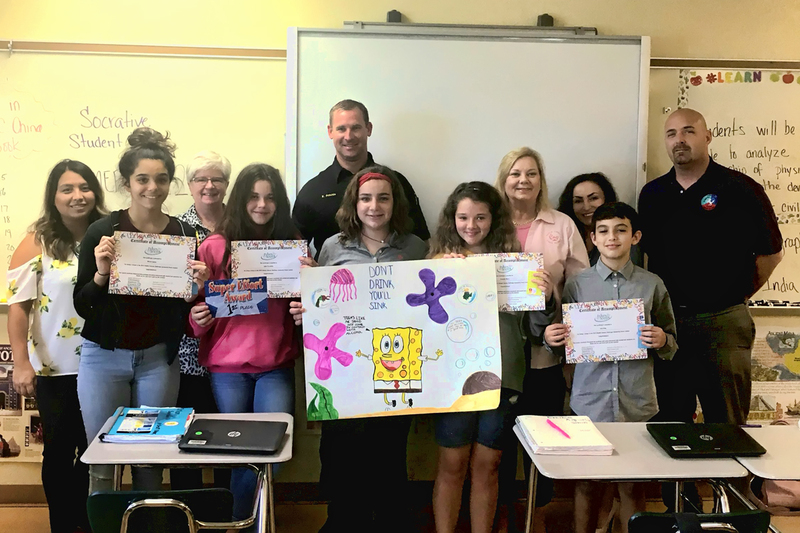 As a supplement to the Alcohol Literacy Challenge curriculum implemented by Tykes & Teens in Martin County schools, 6th grade students work in groups to create posters to help educate and empower their peers to make healthy choices and avoid tragedies related to underage drinking. Winning posters from each school are then displayed at the Martin County Fair with the public voting for their favorite. The poster contest is hosted by Tykes and Teens Prevention Services in partnership the Martin County Sheriff’s Office, the Children’s Services Council of Martin County, and Martin County Schools. The winning poster for 2019 was created by Anderson Middle School students Milena Santos, Sydni Parenteau, Sophia Maestre, Elizabeth Stockero and Jude King. The students received prizes courtesy of the poster contest sponsors. For more information about Tykes & Teens Prevention Services, contact Dr. Agnieszka Marshall at 772-220-3439. Mental Health Matters, Every Day!